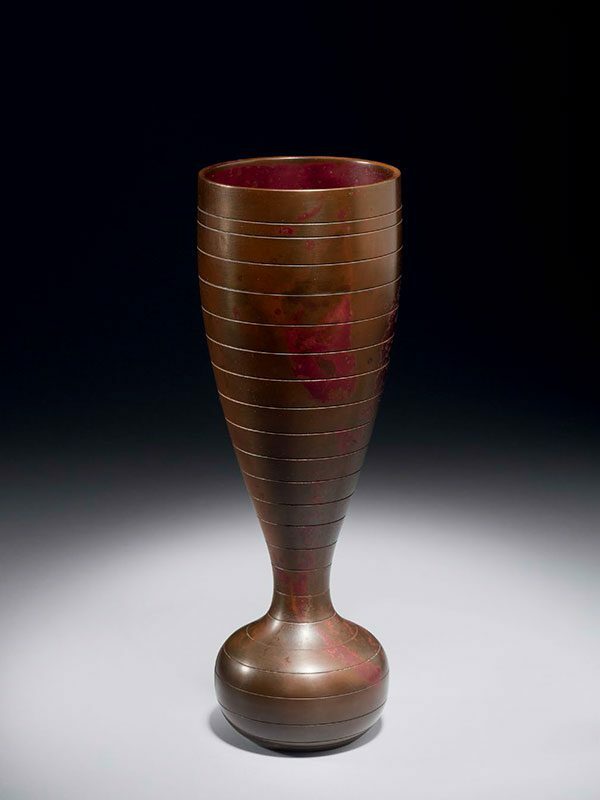 A bronze vase of baluster form, the bottom section of bulbous shape, surmounted by a long, waisted neck that flares slightly inward at the rim. The recessed base is engraved with the signature Masuo saku (made by Masuo). With the original wood tomobako, inscribed on the lid Chuhan, shido (purple coloured cast bronze, with mottled patterns, flower vessel) and inside Nitten hyogiin. Hara Masuo saku, with the seal Masu (made by Hara Masuo, Nitten Exhibition Committee judge). Hara Masuo was born in Okubo, Kashiwazaki city, Niigata Prefecture, in 1934. In 1952 he began to study metal crafting under Kitahara Sankei, a prominent member of the Nitten exhibitions and former president of the Japan Art Crafts Association. In 1957, at just 23 years of age, he became a member of both the Chukinka Kyokai (Cast Metal Artists Association) and the Echigo Kogeikai (Echigo region of the Japan Art Crafts Association). Equally in 1957, at the 13th Nitten Exhibition, Masuo won his first major award. In fact he was awarded at the Nitten exhibitions six times between 1957 and 1963 (including one ‘Special Award’ and the ‘North Polar Star Award’). In 1961 Masuo exhibited at the Nitten exhibition and became a member of the Gendai Kogei bijutsuka kyokai (Modern Art Crafts Artists Association) and in 1963 he received an award from the Niigata Prefectural Art exhibitions. He received many awards in the latter half of his career, including two from the Japanese government (the prestigious ‘Prime Minister Award’, and the ‘Ministry of Education and Science Award’). In 2006 his recognition at the Nitten exhibitions was rewarded when he became the President of the organisation. One of his latest exhibitions was in 2009 at the Centre of Culture and Industry of Kashiwazaki city, Niigata Prefecture, where he now resides as a respected and accomplished artist.